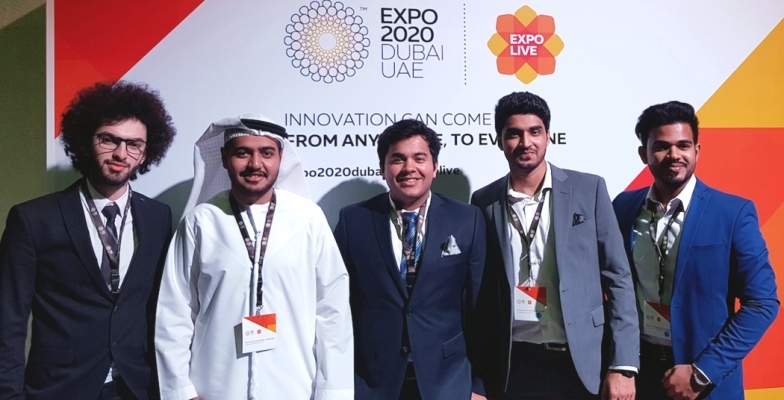 Two teams of students from the College of Engineering (CEN) at American University of Sharjah (AUS) were recently honored for their innovative projects by the Expo Live 2020 University Innovation Program. This recognition reinforces the university’s reputation as a center for advanced and inventive research work in the region. Mechanical engineering majors Owais Alam, Nasimul Hassan and Marya Khan won a research grant of up to AED 25,000 for their project entitled Porous Titanium for Biomedical Body Implant Applications. In order to fix a fractured bone, after an accident or as a result of a birth deformity, titanium is widely used as bone plates, staples and bone screws. This is because titanium is biocompatible, highly corrosion resistant and durable. However, most titanium implants consist of dense components, which lead to problems such as bone resorption and implants loosening inside the body due to biomechanical mismatch of the elastic modulus. To overcome these problems, the project focused on investigating porous implant structures, since a reduction in elastic modulus, coupled with bone integration through tissue ingrowth into pores, can reduce problems of stress shielding and osteolysis. Currently, implants are imported from bio-medical companies based abroad, primarily in the US, the UK and the European Union. Development of this novel materials technology will enable the opening up and establishment of a new manufacturing capability locally that will help bolster the growth of small and medium scale enterprises (SME) based in the UAE. Officials from Expo Live 2020 are currently in the process of finalizing the grant agreement. Once this step is done, they will visit AUS to meet with the students to discuss their project implementation plan (over the course of the next six months). A prototype of the porous titanium body implant will be built followed by laboratory scale testing to prove the concept. The second project honored focused on the development of an advanced light weight material using ceramic hollow spheres for use on military armored vehicles for enhanced vehicle protection, lower fuel consumption due to reduced weight, reduction of greenhouse gases and reduction in logistics costs. Entitled the Hollow Sphere Safety Equipment, the project was developed by mechanical engineering majors Yash Mathur, Mohamed AlSalami, Shad Abdulla Ali, Nawfal Sayed and Fathi Abbas. This team also won a research grant of up to AED 25,000 as well as help from experts in the field to build a laboratory scale prototype of an armored vehicle part which will be tested under actual operating conditions to prove the concept. "We thoroughly enjoyed the invaluable experience gained at Expo Live 2020. As a result of our participation, we learned key presentation and communication skills on how to successfully pitch novel ideas in front of potential investors, entrepreneurs and industry experts."